This type of case involves a UFO hovering over water. The witness describes a column of fog, mist, haze or water ascending from the surface of the water, up to the craft. The terminology generally used in the description of the observation is “sucking up water”. This column, I believe, is caused by the rotation of a field in a vertical plane that encompasses the UFO. This is best visualized by going back to physics 101, and by inserting a bar magnet vertically into the center of the UFO, sprinkling iron filings on it, and observing the magnetic lines of force going up from the top (North Pole) arcing to the sides and down, and then going back up through the bottom (South Pole – see figure 1). As this field rotates it causes a fiction on the abutting atmosphere, causing an updraft at the bottom. 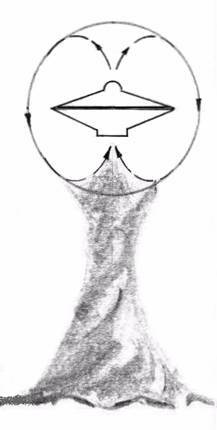 This, and what in most cases is seen as a horizontal rotation of one part of the UFO, causes a swirling vortex to be formed below the UFO. This can be equated to a vortex similar to a person rotating a finger through still waters in a pot of water at a rapid rate – eventually causing a maelstrom to occur. My paper “Physical Influences of a UFO on Water” explains this process in more detail and can be read at: http://www.waterufo.net/PIufoW.php . It is based, in part, on he cases listed below.